More strikingly still, Fidesz and PiS were not radical outsiders emerging from the fringes, but large right-wing parties once considered part of a pro-Western centre-right mainstream, whose representatives still sit with German Christian Democrats and British Conservatives in the European Parliament. Much of the growing literature on ECE backsliding has focused heavily on the actions of illiberal political entrepreneurs in Hungary and Poland’s national-conservative governments. Following on from this, some have pondered if and how EU institutions and leaders can respond through the Union’s existing Article 7 rule-of-law procedures (now invoked against both Warsaw and Budapest). However, there has been very limited reflection on why expectations of ECE democratisation have proved so wrong. The dominant line of argument has been that existing analyses were right in theory – correctly picking out the key factors driving or obstructing democratisation – but, unfortunately, wrong in practice: EU democratic leverage, for example, now appears to many, on second glance, to have been too weak, too short-lived or too patchy to lock in democracy. We find this unconvincing. In a recently published article, we call for a more fundamental rethink of the reasons scholars called ECE democratisation so wrong – and for a broadening of attention to take in not only troubling authoritarian dynamics visible in Hungary and Poland, but also ECE member states where backsliding is less overt. We also suggest that the focus needs to be less on populist outsiders, but rather on the established, outwardly liberal-democratic, mainstream parties, whose emergence and growth is so central to the previously-told story of ECE democratic success. We argue for a rethink of how political institutions work – whether the domestic institutions of ECE states, the conditionalities that applied to them as candidate states, or the EU rules binding them after they joined the Union. This means moving away from the familiar image of institutions as an external check on voters and politicians steering their behaviour into democratic channels through carrot-and-stick incentives until liberal democratic politics finally become second nature, or the political and economic cost of unmaking a democratic settlement becomes too high to be a practical political proposition. In the place of these familiar incentive-based frameworks, we argue that the ‘discursive institutionalism’ developed by Vivien Schmidt offers a fresh perspective. Schmidt’s work sees actors and the institutions they inhabit as symbiotically linked: institutions work the way the they do, not by fencing actors in, but because of the underlying ‘background ideas’ that politicians and citizens bring to them. Politicians (and citizens) start to think outside the institutional box and rethink their own identities and the nature of the political game they are playing. In other words, it is actors that make even well-established institutions what they are. This means that in a region undergoing democratisation like ECE, the quality and stability of democracy depends not only on the institutional frameworks chosen, but also on the domestic actors (usually identified as liberal ‘reformers’) implementing the liberal-democratic institutional settlement. Assessing the potential for democratic backsliding in the region thus means more than just tracking the rise of overtly illiberal parties, but also examining the political discourse of parties of this (supposed) liberal mainstream. East European liberals’ accommodation of ethnic nationalism has left the region’s democratic institutions vulnerable. The discursive agency of political actors. In Bulgaria, despite the political crisis triggered by nationwide protests against high electricity costs and corruption in 2013 and relatively high numbers of refugees entering the country in 2015-6, the discourse of the small liberal groupings such as the Reformists has remained relatively consistent with the pre-Accession period: politics continued to be framed as the struggle of the liberal middle class for ‘European’ values against a corrupt neo-communist establishment with Roma, Turks and poorer citizens subtly (and sometime not so subtly) written off as an unadaptable underclasses serving to bolster clientelist and populist politics. 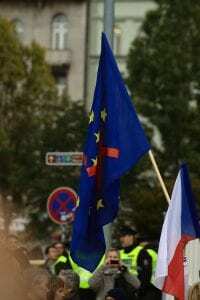 In the far less crisis-hit Czech Republic, by contrast, we found a very overt reorientation to illiberal politics by some prominent politicians on the social democratic left, now seeking to foreground the narrow ethnically-defined notion of national identity, which had previously remained in the background. Politicians on this illiberal wing of Czech social democracy have developed a new conception of centre-left politics that introduces the alleged need to defend the Czech Republic against the (supposed) threat of mass immigration to defend the welfare state alongside older concerns such as the push for a high-wage social democratic economy and the country’s post-1989 ‘return to Europe’. These developments do not necessarily pave the way to frontal assaults on liberal institutions of the type seen in Hungary. However, the conservative-nationalist background ideas have long set the limits of the politically possible even for pro-European liberal and mainstream forces in ECE which in turn has limited the development of fully liberal institutions. This accommodation to ethnic particularism underlying liberal reform politics has provided a route for an explicit turn to a more illiberal, nationalist politics and illiberal ‘reforms’ to democracy and the rule of law. It is thus the limitations and changeability of Eastern Europe’s liberal mainstream, rather than the eruption of radical outsiders, that best explain the weakness of the region’s democracy. Applying a ‘discursive institutionalist’ perspective to the democratisation of ECE does, however, bring good news – albeit qualified: if the ability of citizens and leaders to think and rethink institutional settlement means that democracy cannot easily be locked in, then the same applies to illiberal institutional settlements, which may prove equally changeable. Seen from this perspective, the key to preventing democratic backsliding in East Central Europe may lie in engaging with shifting political identities of politicians and voters, rather than seeking ever more powerful carrot-and-stick mechanisms. Seán Hanley is associate professor of comparative Central and East European politics at the UCL School of Slavonic and East European Studies. His research interests include party government and its alternatives, the rise of anti-establishment parties, and democratic backsliding in Central and Eastern Europe. He has a special interest in Czech politics. He tweets @drseanhanley. James Dawson Lecturer in Comparative Politics at Coventry University. His doctoral thesis (University College London, 2013) was published as Cultures of Democracy in Serbia and Bulgaria (2014, paperback 2016). His research focuses on the tension between liberal norms underpinning liberal-democratic institutions and the ethnic-nationalist and pro-authoritarian norms they compete with. Their co-authored article “Foreground Liberalism, Background Nationalism: A Discursive‐institutionalist Account of EU Leverage and ‘Democratic Backsliding’ in East Central Europe” was recently electronically pre-published by JCMS: the Journal of Common Market Studies.